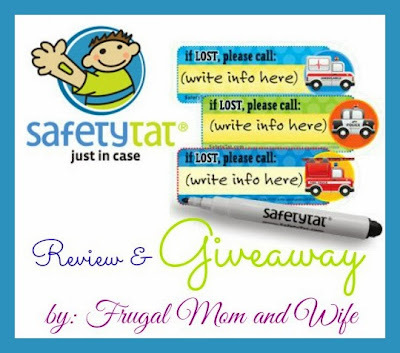 Frugal Mom and Wife: SafetyTat Review and Giveaway! Alright parents I am about to key you in on the latest creation to alleviate some of the worry for when your kiddos are out and about. 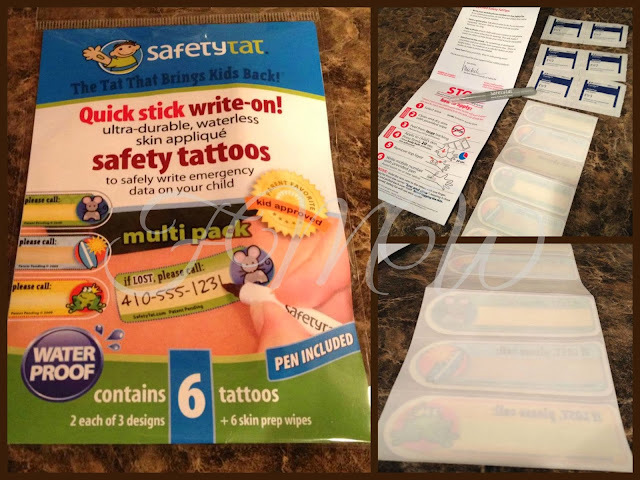 That's right the SafetyTat: Kids Temporary Safety Tattoos! Requires no water to apply. Quick Stick Write-on! Child ID Tattoo is a peel-n-stick skin applique. Made with proprietary tattoo material, Tateck®, this ultra-durable skin safe applique "tattoo" sticker is sweat proof, waterproof and will last an extra long time!Up to two weeks or until you are ready to remove it. The Quick Stick Write-On! Simply peel and stick, that's it. Perfect for traveling with children, theme parks, school field trips, drop-off birthday parties and play dates, sporting events, scout trips and extracurricular activities. These skin applique tattoos are shipped BLANK, so you can write your information on them with the included waterproof tattoo marking pen. So when your kiddos are on the go, you'll know there is that much more safety provided for your child. As seen on the Today Show, Good Morning America and featured in Parents Magazine, Mom Magazine and First for Women Magazine. Quick Stick Write-On! SafetyTats are the proud Winner of the iParenting Media Greatest Products Award. My review on the SafetyTat is from a special needs parents point of view. My daughter has Autism and is currently non-verbal. With that being said my guard is on full blast 24/7. She cannot tell someone she is lost nor provide them with any information leading them back to me or my husband. Even though we watch her like a hawk you never know when that moment could be that the one time we look away, "Where did she go?" With SafetyTat my husband and I feel so much better about going places with a lot of people or her attending field trips. Regardless if you have a special needs child or not these brilliant tattoos really do ease your mind and make outings that much more enjoyable. 18 pack just $19.99 Includes 18 SafetyTats and one tattoo marking pen. 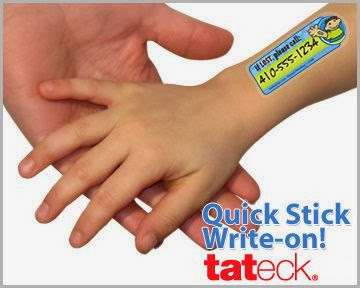 View an applied Quick Stick Write-On! temporary ID tattoo here and read the ID tattoo application instructions for more detailed information. Quick Stick Write-on! products should not be applied to sensitive skin or on those that have known skin allergies. Here is your chance to win your very own SafetyTat 6-Pack! This is a great idea! I have seen it recommended to use a permanent marker to write your number on your child's arm when you attend crowded events with them (e.g. amusement parks) but these are much cuter than marker all over their arms, plus kids love temporary tattoos! This would be nice when we are visiting DisneyLand or LegoLand. Thank you for sharing. Great idea! This would really ease the mind when taking the kids to a crowded location. Anything can happen so quickly. Great idea! These definitely look handy! When my son's older, I'll get him a RoadID to wear on his wrist, but these would work better for right now while he's little. would be handy at the amusement park or on vacation! This is interesting ... and a great idea! Definitely great to have when you go out. You just never know, right? I have two three year olds and this would be nice to have. Thanks for sharing.